Today glyphosate could be banned for good if MEPs support the Environment Committee's decision last week. The license for glyphosate is up for renewal, and mounting evidence has shown increasing dangers to the environment and human health. More than 1.3 million people have already told the EU they want a ban. Germany and France are important players in this decision. France have previously said they will support a ban, and EJF urges Germany to do the same. Glyphosate has been connected to environmental problems and human health issues, including cancer. It is the world's most common pesticide and is a key ingredient in Monsanto's Roundup. Last week the EU's Environment Committee voted in favour of banning glyphosate. Today, the European Parliament will decide whether to support this call. Voting against renewing the license for glyphosate would mean that steps would have to be taken immediately to stop all use of the harmful pesticide by 2020. It is vital that the evidence is listened to now. If the license for glyphosate is renewed it will go on causing more and more damage. To lend your support you can join the campaign on Twitter and tell MEPs why they need to #StopGlyphosate. Glyphosate, the world’s most common pesticide damages the environment and risks human health. The licence for glyphosate in the EU has now expired, providing the EU with an opportunity to ban this harmful pesticide from future use. A hearing in the EU is being held today examining Monsanto’s influence on the decision-making process. As the largest manufacturer of glyphosate, Monsanto has been influential in preventing a ban in the past. After announcing they will not be present at today’s hearing, all Monsanto lobbyists have been banned from operating in the European Parliament. In 2016, The World Health Organisation described glyphosate as ‘probably carcinogenic’. 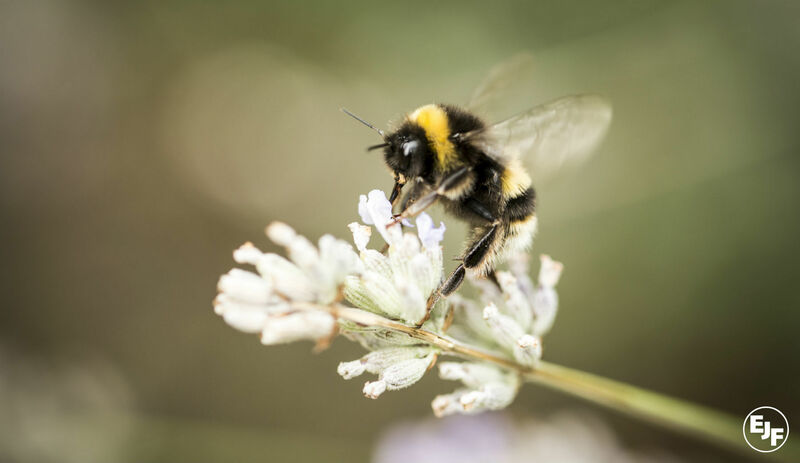 Glyphosate has also been shown to negatively affect soils, insects and bees as well as having other impacts on human health. France has recently announced a ban on weedkillers that combine glyphosate and tallowine, both of which are found in Monsanto’s Roundup. The decision was made in response to mounting evidence about health risks. However, a recent meeting in the European Parliament suggests groups on the right and left of the political spectrum have shown their shared intention to support a ban. Germany has taken a leading role in the assessment and licensing process in the past, and will be an influential player this time around too. The Environmental Justice Foundation (EJF) is urging German ministers not to let the upheaval of the recent elections distract from the importance of this decision. The German government and the federal institute for risk assessment have for many years classified glyphosate and its application as ‘risk free’, which the evidence shows is simply not true. As the EU now has the opportunity to ban this dangerous pesticide, Germany must listen to the evidence that has emerged in recent years. After the recent parliamentary elections, Germany has to form a government; but the decision of whether or not to back a ban will rely on the outcome of the coalition debates and to what degree parties opposed to glyphosate like the Greens and the Lefts can hold steady with their position. The Ministry for the Environment, Nature Conservation and Building and Nuclear Safety currently holds an influential position. Currently this is still led by Social Democrat Barbara Hendricks, who showed their scepticism on glyphosate before. Glyphosate is the most common pesticide worldwide. It is a key ingredient in Roundup, used by both farmers, local authorities and the wider public. The effects of RoundUp build up over time. As RoundUp is used on plants and in the soils, the plants and soils develop resistance, meaning new, stronger, strains of RoundUp always need to be developed. Last year traces of glyphosate were found in 14 of Germany’s most popular beers, meaning the harmful chemicals are being directly ingested by humans. Several European cities have already banned the use of glyphosate due to health concerns. After forming a new government German ministers and the government must take the evidence into consideration and vote to ban glyphosate.